As far back as he can remember, M.S. in Occupational Therapy program graduate Kai Mitchell wanted to serve his country. "Since I was a child I always wanted to join the military," he said. "At the time I joined, I was coming off of a break from college to figure out what I truly wanted to do professionally." Mitchell currently serves in the Air National Guard in Duluth, and his service provided the means to fund his education and travel across the globe — from Alaska and Hawaii to Japan — while building life-long relationships. 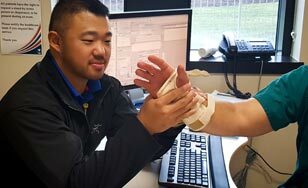 The passion for his pursuit of a Master’s in Occupational Therapy (OT) wasn’t directly derived from military experience, but Mitchell believes his work will benefit the military community in a significant way. "OT has allowed me to open up new doors within the military and utilize my knowledge to provide assistance in a place I am passionate about," he said. Because of his time in the OT program at St. Scholastica, Mitchell said he was well prepared for his internship at prestigious Walter Reed National Military Medical Center — a place well known as the flagship of military medicine. "The program [at CSS] lays the foundation for students to become entry-level therapists," said Mitchell. "I wanted to work with military members and their families. To me, this meant it [Walter Reed] was the best place to perform my fieldwork experience." Mitchell said his time at Walter Reed allowed the privilege of complete immersion in his chosen field. "I got to perform roles that a licensed OT would do under the guidance of a clinical instructor," he said. "I have learned so much, and have gotten to meet so many different individuals, whether it is a service member or their family member. Taking care of this population is an honor." According to Mitchell, the Veteran’s Resource Center at CSS played a vital role in his time on campus. "[VRC Coordinator] Jessica Johnston really went above and beyond to ensure that the student veterans were being taken care of, whether setting them up with benefits, bringing in external resources, advocating or simply showing appreciation towards them," Mitchell said. The road doesn’t end with an internship, of course. Mitchell has his eye on passing certification exams and pursuing continued work with military members as an OT. Overall, Mitchell believes The College of St. Scholastica is a place where veterans can thrive. "I would recommend CSS to other veterans and definitely ones who are interested in OT," Mitchell said. "It is a great career field with a lot of opportunities on the civilian side and military side if they want to get a commission as an officer." "I would recommend CSS to other veterans — definitely ones who are interested in occupational therapy. I have developed friendships and relationships with many of my classmates, and also have good relationships with faculty members. Unlike larger schools, if they see you in the hallway, they take time to talk."